It's super easy to get started with Sitemagic CMS. You can either use our free cloud platform powered by Sitemagic CMS, or you can download and install it yourself. Should you ever find yourself in need of help, then jump right to our Facebook group to ask for help. With Sitemagic Cloud we take away all the technical hurdles. We make sure your website is always up-to-date and secure, and allows you to connect a domain name and manage your e-mail accounts - all free of charge. Read more about Sitemagic Cloud. 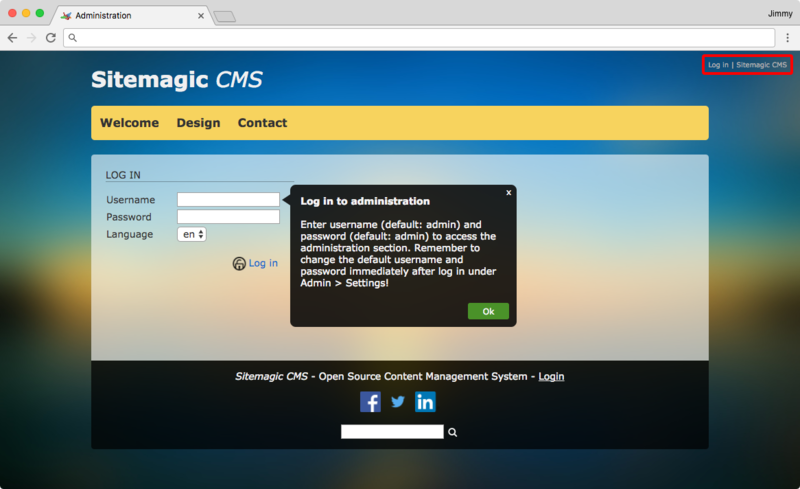 Fortunately installing Sitemagic CMS is very easy compared to other Content Management Systems. However, sitemagic.org actually explains the steps necessary quite well, so rather than repeating what as already been written, let's just link to the existing guide which is found here: How to install Sitemagic CMS. Once the Web Installer is done, it will provide a link to your brand new website. Click the link and continue below. When Sitemagic CMS has been installed, go to the website, and click the Log In link in the upper right cornor (see image below). Now enter the default username and password (which are both "admin") and click Log in below the input fields. Once logged in, Sitemagic CMS will check for updates, and you will be alerted if an update is available for you. And don't worry. 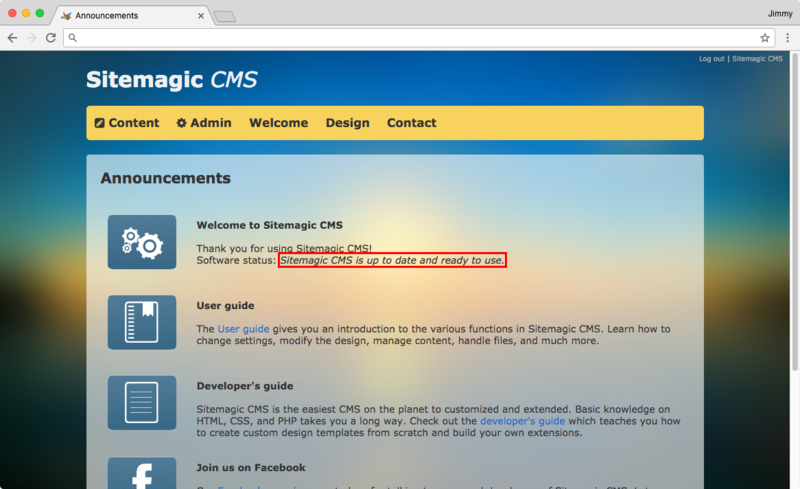 Updating Sitemagic CMS is just as easy as installing it - a click of a button. But for now everything is up to date and ready to use. From here on Sitemagic CMS will help you get started with small tips and tricks like shown below. 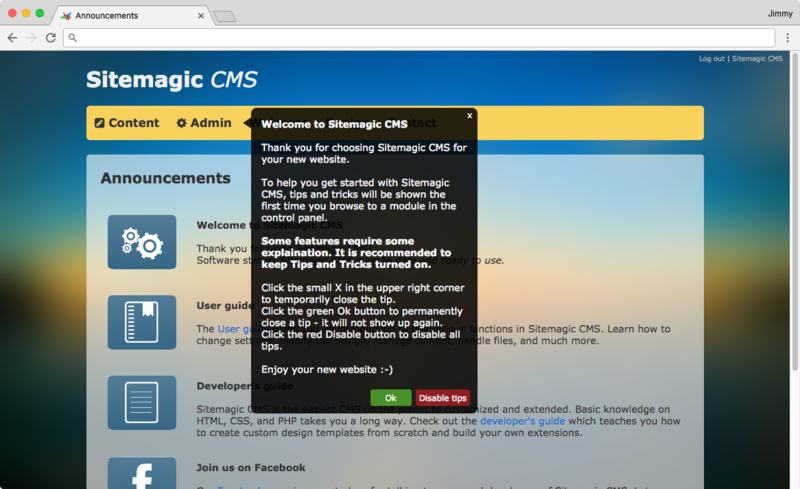 It is highly recommended to keep this feature enabled if you are new to Sitemagic CMS. Now continue with How to change username and password to make sure nobody else can log in to your website and change content.